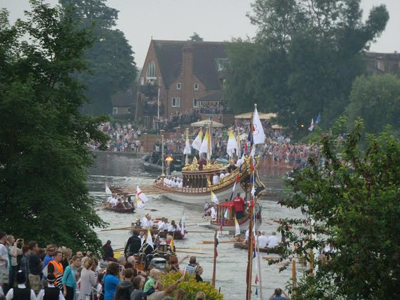 Crowds lined the banks of The Thames last weekend as Her Majesty’s Watermen rowed from Hampton Court Palace to the Tower of London in the annual “Tudor Pull”. The palace-to-palace rowing event on Sunday kicked off around 10am with a ceremony at Hampton Court during which the ‘Stela’ – an ancient piece of medieval water pipe made from a hollowed-out tree trunk which symbolises the power of The Thames – is passed to the watermen who then took it up river to the Tower in the royal barge Gloriana. The barge, which was accompanied by a fleet of other traditional rowing craft, stopped at several locations along the journey, before it arrived at the Tower in Sunday afternoon where the ‘Stela’ was presented to the Governor. The event is also said to commemorate the sinking in 1256 of Queen Eleanor’s royal barge under old London Bridge. For more on the Historic Royal Palaces in London, head to www.hrp.org.uk. PICTURE: Courtesy of Historic Royal Palaces. Our new special series will kick off next week!